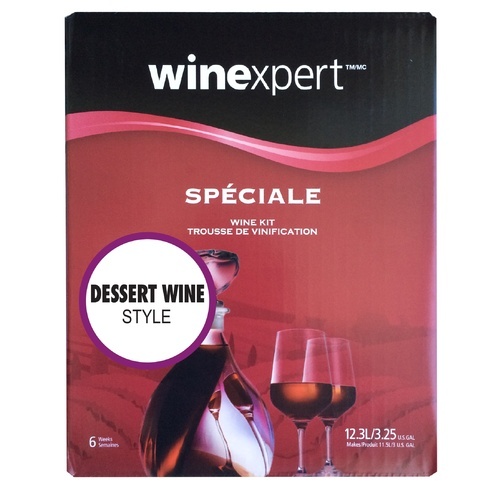 Winexpert's Speciale brand incorporates their specialty wine kits. Ready to bottle in about 6 weeks and makes approximately fifteen 750 ml bottles. I'm a port wine lover and this dessert wine turned out well enough for me. Now, I can enjoy a glass or two of the "good stuff" and if I feel like having more, I can simply open up a bottle of this and keep enjoying the style. As usual, I deviated from the instructions to make it a "chocolate/cherry port"...but be sure you know what you're doing so you don't ruin your kit.